An asset is something of value. We usually think of assets in terms of money or possessions. These assets can be spent, lost, or taken away. Personal assets cannot! We often limit our own success by not recognizing the assets we already have that can make an impact with the right person at the right time. The key is to identify them, build them, and use them to improve your chances for success, especially in your financial position. Education assets are things you know by formal or informal study, practice, and training. Skills and talents are things you are interested in, like to do, do well, or that come naturally to you. Skills and talents might be a result of our education. They may be physical, such as strength to repeatedly lift 50lbs, or endurance to work 12 hour shifts. They may be academic, such as being good with numbers, problem solving, and communication. They may also be practical, such as sewing, decorating, carpentry, or fixing small appliances. Connections are assets too. Think about your immediate circle of friends, family, neighbors, co-workers etc. Of these people, who do you respect the most and why? Is or has anyone been a mentor to you? Who can you rely upon? Who has helped you along the way? Click My Asset Four Square to download the worksheet to discover your own. 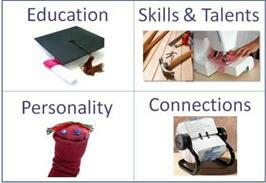 If you need a starting point, use the Personal Assets Questionnaire which may help you identify some specific skills. Remember that assets are only valuable when they are being used. So how do we use our personal assets to our increase our chances of financial advantage? It’s a matter of connecting our personal assets to marketable job skills and including them on our resumes and during job interviews. The Put Your Personal Assets to Work page discusses how to do this. Before that though, let's explore the top personal asset, education.